I kind of hate and love sewing, especially on bigger projects like this star quilt. You need more of everything than what you anticipate — more fabric, more calculations, more thread, more money, more time — but then I love it because duh, you’re making pretty things with your own two hands that you’ll use. It’s satisfying. This star quilt was this year’s winter project, and I’m really happy with how it turned out. My plans went into motion when I found a pile of scrap linen at the tip shop, the collected offcuts from some other project. It was unstained and the fabric was in great condition, so I bought the whole stack (for the princely sum of eight dollars) and thought about what I’d do with it. It’d have to be cut up and assembled into something, as the pieces varied greatly in size. Pillows? Nah. Duvet cover? Not sure I have enough linen. Well then, how about looking through your fabric stash and making a quilt? Okay! The linen cleaned up real nicely in the wash, and I looked through my fabric drawer and decided on using a burnt orange polyester, aqua curtain remnants, chocolate faux-leather and a grey wool/poly mix. I liked the combination of colours and textures. I followed this pattern from McCalls Quilting, but made substantial modifications. (I liked the idea of a more modern, minimal quilt pattern.) It’s made up of 12”x12” blocks that are then attached to one another. Pretty straightforward. The pattern recommended a “Confident Beginner” skill level and I was like, yep, that’s me, a confident beginner. I reduced the number of blocks — 5×7, instead of 7×7 — because I wanted the quilt to be small enough that it can be used on our futon, the couch, or at the base of our bed. It’s easy enough to add more or less. Aside from the linen, the fabrics I used for the top were mostly synthetics. I couldn’t iron them directly or else they’d burn, but I was still able to press those seams by placing a thick, folded towel between the iron and the fabric. While I used recycled fabrics for the top layer, I bought 4m of polar fleece for the batting (enough for two layers) and a flat queen sheet for the backing. Low thread count sheets are recommended for this purpose, as they’re easier to work with. Quilting requires laser-focused attention to detail. Pin everything. Press everything. I probably have no business putting together instructions, being that I’m far from an expert on this, but I won’t deny that I enjoyed making this! Hopefully it all makes sense. 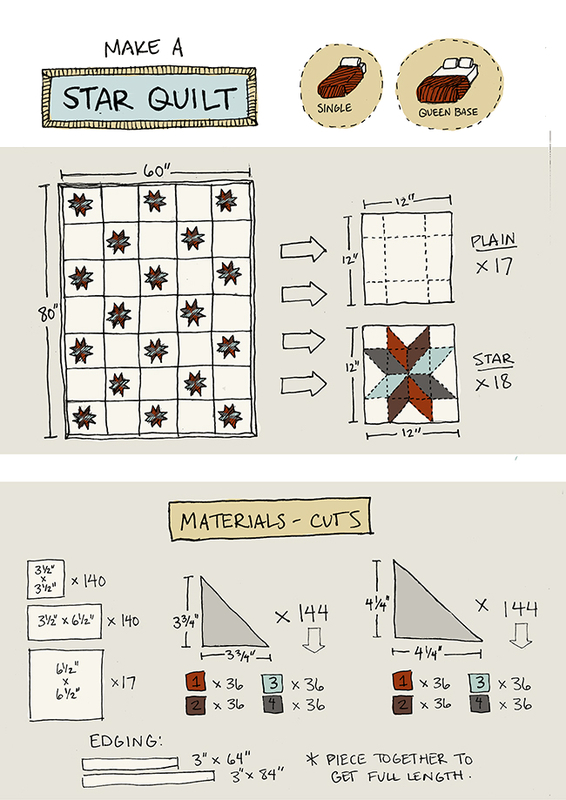 If you want to read further, there’s a detailed description of assembling the star blocks in the McCalls pdf. (It’s a slightly different method than what I used, but mostly the same.) It’s pretty easy to customise if you want a larger quilt or more border margins or what have you. Guess who else really likes the quilt? Mishka had a look when I was pinning layers into place and, well, good luck getting her to leave. 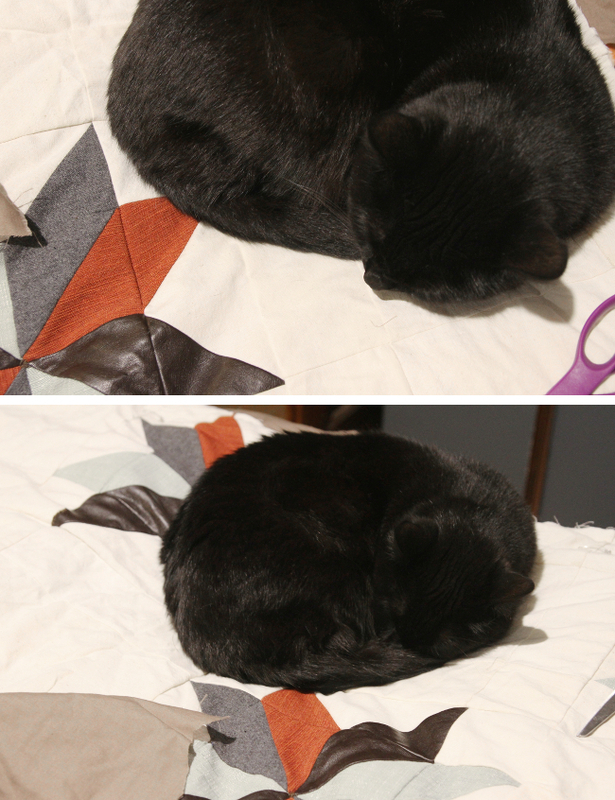 White blanket, black cat. Of course. I can see how quilting is addicting — as soon as I started on this, it sucked me in. I learned a lot from this. (Two lessons off the top of my head: get a rotary cutter and cutting mat; you can never be too careful or precise.) I might try making another one at some point, but maybe not for another year or two or three? Quilting is pretty full-on! There is no end to your talents! The mere thought of quilting is enough to drive me nutty, but I can appreciate your patience and it looks fabulous in your room. What I’m really drooling over though, are your gorgeous illustrations. You are so clever. Love this quilt. Years ago I made one for each of my daughters and then took a break…that lasted 10+ years. Seeing this makes me want to get back on the quilting wagon. Thank you, Ana. That’s so sweet that you made one for each of your daughters. I love the stories that go into other peoples’ quilts. It’s SOOO beautiful oh my god. I wish I could quilt and make something like this! I don’t have a sewing machine so that’s not gonna happen. But maybe one day! WOW!! Your iris quilt is gorgeous! I have always wanted to make a quilt. I love the pattern that you chose. I have a queen size bed and I am not sure how much material I would need. Do you have any idea how much I would need? Yours turned out beautiful. Hi Sharon, thanks so much! Between what I used and what the original, unmodified pattern (link) called for, I’d estimate: 4 yards of plain fabric, 1 yard each for all four colours, 108″ x 108″ for the batting, 9 1/2 yards for the backing (or a flat king bedsheet). I just found you. I love the way you pieced the plain blocks instead of just plugging in a large piece of fabric. Beautiful!